← 7 DIY Tips to Treat Your Lawn Right This Summer and Make It Super Green! While it may only take an afternoon for your kitchen or living room to become disheveled, the front and backyard tend to grow steadily more unkempt over time, which means many homeowners don’t even realize how cluttered their outdoor spaces are becoming until the yard is a total mess. Orderly design is just as important outdoors. Fortunately, I have a few tricks to make organizing your outside spaces easy. You can kill your yard’s clutter on the cheap with the following four DIY projects. To prevent your kids’ favorite stuffed animal from death via water and dirt, it is wise to have different sets of toys for indoor and outdoor play. However, that means you need a similarly solid strategy for organizing outdoor toys. The most effective toy organization in any yard is using labeled bins. By painting a square of chalkboard paint on a number of mid-sized plastic containers, you can create a sensible storage for a variety of outdoor toys. This stops kids from scattering all their toys at once; instead, they know exactly where to find the toy they want ― and more importantly, where to put it back when they’re done. One of the most important principles of toy storage is the regular purge. Every season or so, you and your kids should sift through the outdoor toy bins and resolve to give away any playthings that no longer see any action. The same should go for you as well: Every few months, you should survey your belongings in the backyard and ditch those that you no longer want or use. Large and ignored items, like your broken down family boat, can go to donation. As long as it isn’t in your backyard, you’ll have a more organized outdoors. The fact is, you need to put your yard tools somewhere. You could stash them in your garage, robbing the real estate your car desperately deserves. You could stack them on your back porch, coopting entertaining space and creating an eyesore. The best option is placing them in their own storage area, but prefab sheds from home improvement stores can be expensive. That’s why you should make your own. Using these directions from Popular Mechanics, we built a shed in my backyard that was large enough to house our larger lawn tools (lawn mower, leaf blower, shovels, rakes) as well as a variety of miscellaneous items we didn’t need in the house, like hammers, paints, and fold-up camping chairs. If you don’t need as much outdoor storage space, you might consider a smaller design, like this adorable shed made of windows and doors or this little shed that costs less than $260 in materials. No matter how beautiful your garden is, there will always be at least one blot on the landscaping. For me, that fright was the house trash containers, but for others, that might be a disorganized half of the patio or a derelict corner of the garden. Until you can repair your yard’s blemishes, you can hide them. 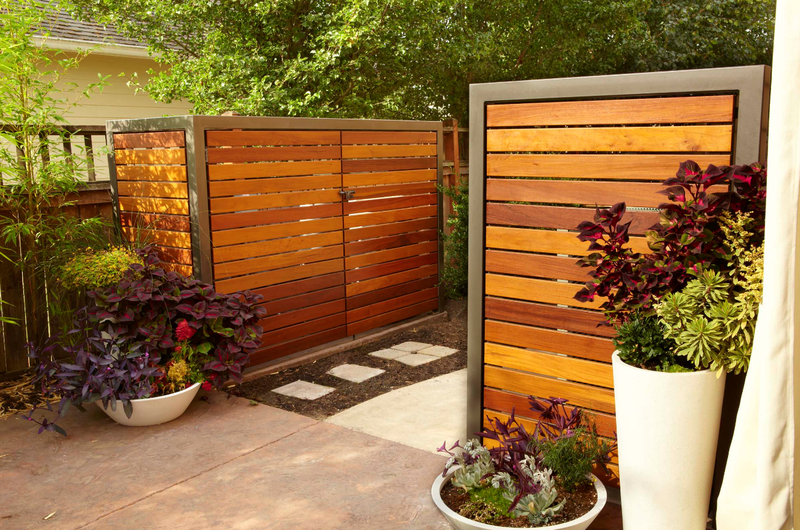 Most home improvement stores have outdoor privacy screens of varying sizes, but it is entirely possible to make your own. I used old closet doors like this to build a wall around my garbage bins ― but I also staked them down to make the wall more resistant to inclement weather. 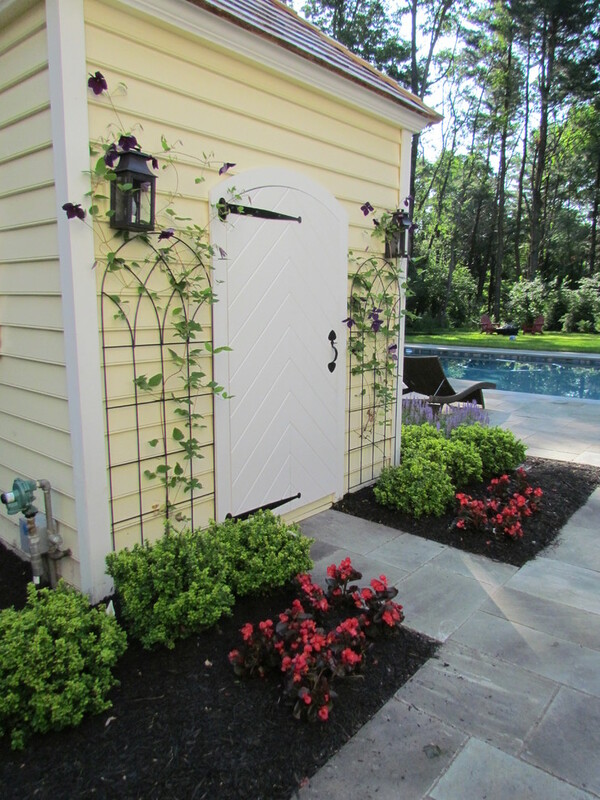 You could hang draperies from your patio to create a secret storage area or place stand-up screens around your yard when guests come to visit. Chalkboard paint. I painted a small section of my home’s wall, beneath the patio awning, with chalkboard paint to allow my kids a sheltered place to draw and be creative. Plus, I can erase their doodles and add my own when I expect more adult guests. Mirrors. If your yard is small, you can make it seem larger by hanging mirrors on the back wall or fence. You should secure them firmly, so they don’t blow about in bouts of windy weather. Galvanized buckets. A combination storage solution and decoration, galvanized buckets are usually my go-to for outdoor design. I have a massive bucket as the base for my patio table, a few smaller ones to hold wrapped-up hoses, and tiny ones to serve as ice buckets during gatherings. This entry was posted in DIY and tagged backyard diy ideas, how to hide outdoor garbage, outdoor diy projects. Bookmark the permalink.